New York City is poised to launch a major reform of its sprawling commercial waste system, in which dozens of private haulers now deploy thousands of garbage trucks every night to collect about three million tons of waste per year from about 200,000 businesses. Dangerous working conditions and alleged wage theft from workers, many of whom are immigrants and formerly incarcerated individuals vulnerable to exploitation. Grossly inefficient and overlapping truck routes caused by dozens of companies competing for customers, adding more than 11 million unnecessary diesel truck miles annually to traffic on local streets and highways. Greenhouse gas emissions and air pollution from exporting and landfilling commercial waste via transfer stations and diesel long-haul trucks clustered in low-income communities of color such as the South Bronx, North Brooklyn, and Southeast Queens. Inequitable and opaque pricing and a lack of recycling and composting services for small businesses. 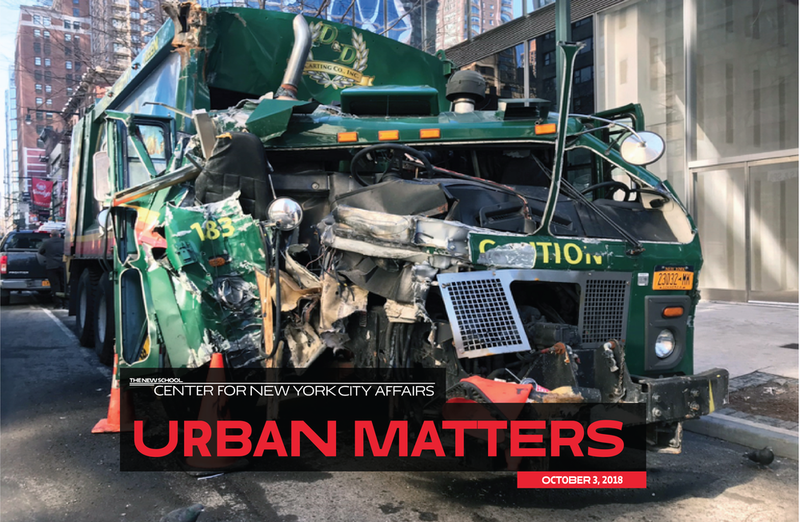 A significant increase in crashes and fatalities involving private garbage trucks, including the recent deaths of two Bronx residents – one of whom, Mouctar Diallo, was an off-the-books worker riding on the truck that killed him. To address these problems, Mayor Bill de Blasio, City Sanitation Commissioner Kathryn Garcia, and key City Council members have announced their intent to implement a franchised or “zoned” commercial waste system, to be phased in over two to three years. It would replace a status quo in which haulers now compete for business citywide. Similar systems already operate in Los Angeles, San Jose, Seattle, Oakland, San Francisco, and other cities. The City would issue a competitive Request for Proposals (RFP) to select one or more commercial waste service providers in each commercial district; they would competitively bid for these contracts. The City would then negotiate terms with the hauler(s) selected for each zone, specifying a range of customer service, pricing, labor, environmental, and safety standards. Penalties for non-compliance could include fines or the threat of a zone agreement being revoked or re-bid. Private sanitation should be a safe, living-wage career and a path to the middle class. As some haulers have engaged in a “race to the bottom” to gain customers, dangerously long overnight shifts and workweeks have proliferated. So have so-called "independent" unions unaffiliated with the AFL-CIO, who have been accused of colluding with employers and undermining labor standards. The RFPs for zoned commercial waste collection can and should set verifiable safety standards, and over time bring private sanitation work up to the wage, benefit, duty hours, and safety standards of the public sector. The private haulers involved should also be required to hire any workers displaced by the transition to zoned collection, and should demonstrate a commitment to hiring and training workers from disadvantaged local communities. Minority- and woman-owned business enterprise (MWBE) participation goals should encourage commercial haulers to use local MWBEs, many of them innovators in waste reduction, as subcontractors. Green job creation through investment in recycling infrastructure. To approach the City’s zero waste goals, its RFPs must give haulers strong incentives to improve their often dismal recycling performance. The City can foster public-private partnerships to build infrastructure such as anaerobic digesters, compost facilities, and recycling plants. These are far more job-intensive than transfer station-to-landfill operations, and could create thousands of local high-quality, green union jobs. Based on employment at SIMS Municipal Recycling, Brooklyn, NY; Zero Waste Energy Design digester, San Jose California; and Metropolitan Transfer Station, Bronx, NY. Cutting greenhouse gas emissions through measurable waste reduction and recycling. An exclusive zone system would allow the City to negotiate uniform, transparent price schedules that encourage customers to source-separate recyclable waste, minimize landfilled refuse, and reduce total disposed waste over time through contract bonuses or penalties. Such enforceable goals will encourage haulers and their customers to form meaningful partnerships with food rescue organizations, donation centers, and other re-use and repair enterprises, with the potential to reduce landfilling and create additional green jobs. Equity for over-burdened communities. The new system should actively seek to mitigate decades of inequitable siting that has clustered diesel-intensive transfer stations and garages, and the resulting emissions and health and safety hazards, in a handful of low-income communities of color. RFPs can incentivize waste haulers to utilize cleaner, more modern barge- and rail-based transfer and recycling facilities (including those operated by the City Sanitation Department). New recycling and compost infrastructure should be fairly sited, use barge and rail transport whenever possible, and haulers selected for the zone system should be strongly incentivized to replace outdated diesel trucks with low-emissions alternative fuel trucks, as other cities have done. Transparency and equity for small businesses. The new system should ensure that businesses can obtain recycling, composting, and garbage service at fair, transparent prices. A 2016 City study of the experience of other cities determined that transition to a franchised or zoned collection system does not cause increased prices for customers. Goals such as living wages, humane work shifts, cleaner truck fleets, and better recycling infrastructure will certainly require substantial financial investments by waste haulers. However, these costs should be at least partly offset by labor, fuel, and maintenance savings from far more efficient collection routes. The City can also mitigate such potential costs by, for example, offering long-term contracts to waste haulers, allowing them to amortize investments over 10 years or more. In New York and cities across the nation, local officials are searching for ways to reduce inequality and increase sustainability. A robust and comprehensive zoned waste collection system will move us in that direction. Justin Wood is director of organizing and strategic research at New York Lawyers for the Public Interest.